Somewhere in Canada, theres a guy sitting at a workbench building loudspeaker drivers. Not a team of workers on a production line -- just one guy, working for a company named Reference 3A. Two more guys build the boxes for the drivers. A lot of audio manufacturers have more people than that simply answering the telephone. This amazes me partly because this small team of craftsmen is responsible for building the loudspeaker called the Grand Veena ($7995 USD per pair) that currently sits in my listening room. Its a tall speaker with five drivers and a sloping front baffle, and it sits on three outrigger cones. Looking at the Grand Veenas straight on, they look like simple rectangles with nothing at all fancy about them. As for what they sound like . . . well, thats the other reason Im amazed. Reference 3A (the "3A" is short for Applied Acoustic Arts), a small company based in Kitchener, Ontario, has been around in its current form for about 15 years. But Reference 3As history goes back to the late 1950s, when French audio designer Daniel Dehay founded the firm. Dehays minimalist design principles are refreshingly simple: Connect the speakers midrange drivers directly to the amplifier, with no interfering electronic crossover. Align the drivers so that all parts of the sound waveform are correctly timed with each other. Design the drivers so that the sound remains in phase across frequencies, and build the domes and cones light and strong so that their output wont break up within their designated frequency range. The result should be minimal distortion and maximal fidelity. From the accolades Reference 3As modest product line has received, they seem to have achieved this result. In addition to the Grand Veena, the line includes the Veena and the LIntegral Nouveau (both two-driver floorstanders), and the Dulcet and the MM de Capo i (both minimonitors). Reference 3As total output for the year is slightly over 900 pairs of speakers -- not enough to create the impact that would make them a household word, even in the audiophile community. The fourth -- or perhaps first -- member of the Reference 3A team is Tash Goka. Hes the president of Divergent Technologies, the Canadian company that directs the operations of Reference 3A. In his younger days, Goka followed bands around Europe writing reviews, recorded singers in the back rooms of record shops, and steeped himself in musical culture. Hes an enthusiast of good music and high-end audio, and its probably fair to say that it is his commitment to Daniel Dehays principles and designs that has made possible the Reference 3A line of speakers. "The basic principles for the design of the current wide-range midbass driver go back nearly 25 years, to Daniel Dehays notes for an 8" driver," Goka told me. "Whats different today are materials like carbon fiber that greatly improve the performance." A veena (in case youve been wondering) is a musical instrument from southern India that looks like the offspring of a lute and a sitar. The Grand Veena is Reference 3As latest venture into the market of speakers of near to full frequency range. With two 8" woofers covering the bass, a 6.5" midrange/midbass driver, a dome tweeter, and a ceramic high-frequency exciter/supertweeter operating above 20kHz (more about this later), R3As intention for the Grand Veena is to leave no frequency uncovered, even those usually considered inaudible. With a rated sensitivity of 90dB and a resistance of 5 ohms (+0.5 ohm), the speaker is compatible with most amplifiers. The midrange/midbass driver is the Grand Veenas heart. It functions unfettered by electronic crossovers or capacitors, which makes it extremely sensitive and responsive to musical information. Its operation is regulated only by the sealed enclosure, which starts rolling it off with a mechanical first-order, high-pass crossover at about 94Hz; its low-pass mechanical fadeout starts at around 3kHz. Cone breakup is minimized through the use of such materials as carbon fiber and an intrinsically rigid "hyperexponential" shape (like the bell of a trumpet), which also helps it achieve its goal of maintaining phase accuracy across its frequency range. That goal is aided, too, by an unusual blunt-ended phase plug in the middle of the driver. A simple, quasi-second-order low-pass filter is used for the two 8" bass drivers. Each cone is made of a honeycomb sandwich of fiberglass and Kevlar -- theyre extremely rigid and lightweight, with rigid cast-metal frames. There is also an internal acoustic device to absorb pressures generated by standing waves. The woofers are vented out the back via a specially shaped port that results in the bass being 3dB down at 36Hz. The Grand Veena is advertised as being able to convey significant bass information down to 20Hz, at -18dB. Obviously, with those numbers and a rear-facing port, optimizing the speakers placements in the room will have a lot to do with how effective they are at the low end of the frequency spectrum. The dome tweeter has a silk diaphragm, a low-mass voice coil, and a copper Faraday ring -- again with the goal of making it as highly responsive and distortion-free as possible. Its low-frequency resonance point is just 590Hz, which keeps it well out of the drivers functional frequency range. The tweeters high-pass filter is a single capacitor. Above the tweeter, both sonically and geometrically, is a rather exotic driver from the Japanese company Murata that Reference 3A calls an "ultra high frequency exciter." This supertweeter is a 12mm, gold-surfaced ceramic dome that expands and contracts, instead of moving in and out in the usual pistonic fashion. Whats most exotic about this driver is that it represents frequencies from above 20kHz to about 100kHz, which are inaudible to humans. It, too, is directly connected to the amplifier without any crossover electronics. "What we hear with this supertweeter is a more spacious soundstage," said Tash Goka. "But even more important is its effect on lower frequencies. It has the surprising effect of making lower-frequency sounds seem better defined." I asked him how this could be so. "Im not sure," he admitted. "It does seem to work that way, though." This was certainly going to be one of the things I listened for. Among the other exotica inhabiting these speakers is Anti-Vibration Magic (AVM), a pricey damping fluid made by another Canadian company, Uniko Electronics, of Edmonton, Alberta. "We paint this on parts of the driver frame, the flexible joints of the drivers, and parts of the speaker box that need vibration damping," said Goka. "We experimented with it a long time, and it makes a big difference." Reference 3A recently decided to include Bybee purifiers as standard equipment on the Grand Veenas. These are installed on the speaker terminals to remove what designer and engineer Jack Bybee calls quantum distortion from the signal. During his naval career, Bybee developed ways of reducing noise in sonar systems, then created these devices for use with audio gear. "We hear them as making the sound more pure, more natural," said Goka. The Grand Veenas I tested were not fitted with internal Bybee purifiers, but came with outboard boxes containing Bybees, to be connected to the speaker cables. I listened to the GVs with and without the Bybee boxes. To minimize resonances, the Veenas cabinet is made of layers of MDF and HDF of different thicknesses and is internally braced. Within the main enclosure, each driver has its own chamber to minimize their interference with each other. The sloped front baffle is a critical element in maintaining the drivers time alignment and thus the Grand Veenas accuracy of sound propagation. The Grand Veena is 51" high, a bit over 10" wide, 19" deep at the bottom, 6" deep at the top, and weighs in at 75 pounds. Three adjustable outrigger spikes solidly anchor it to the floor. The finishes are top drawer -- I saw the gloss piano-black version at the Rocky Mountain Audio Fest, and the finish was flawless. My review samples had a red-maple finish that was subdued and elegant. The Grand Veenas were twitchy to set up. 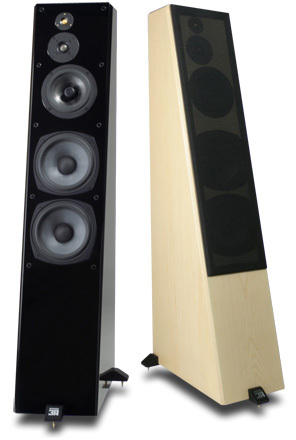 Reference 3A recommends that they be placed at least 20" from the front wall and 16" from the sidewalls, with the speakers slightly closer to each other than to the listening position. They also recommend that the speakers be toed in toward the listening area much less than one might be used to, the optimal off-axis listening angle being 22 degrees. The manual warns that extreme toe-in will affect the phase alignment -- indeed, the midrange sounded muddy when I aimed the Grand Veenas directly at my listening position. The vertical angle is relevant as well, and Tash Goka recommends experimenting with the height of the spikes to adjust the baffles angle and optimally define the acoustic images. The twitchy part was that even a slight change in speaker position resulted in a clearly audible difference in the sound quality or soundstage. Several hours of a quarter inch this way, a quarter inch that way were necessary to get them to where they sounded best. Tweaking the isolation materials under my electronic components also made significant differences, and required more than the usual amount of attention with the Grand Veenas. To break them in, I played the speakers constantly for over two weeks. The associated gear for this review included an Esoteric X-03SE SACD/CD player, a Bent Audio NOH passive transformer linestage, a Conrad-Johnson Premier 350 power amplifier, Triangle Stratos Australe speakers, Legenburg Apollo speaker cables and Hermes interconnects, ESP Essence Reference power cables, and a PS Audio Power Plant Premier power regenerator. If audiophiles were seeking a holy grail (and arent we? ), it is an audio system that will reproduce a recording of a musical performance with total and convincing accuracy. The Reference 3A Grand Veenas took my system as close to that level as Ive yet heard, making more of a difference than any other change of component Ive ever made. Their level of detail, faithfulness to acoustic timbres, and effortlessness of performance were revelations -- not only of what the speakers were capable of, but of what the rest of my system was now able to do. The first thing I noticed was the effortless extension of the treble. There was an ease and speed to the higher frequencies that I hadnt heard before from my system, and Im hard-pressed to recall hearing it from any other speaker Ive listened to outside my listening room. I can only describe the effect with an analogy. At the very end of "The Prayer," a duet by Celine Dion and Andrea Bocelli on the latters Sogno [CD, Phillips 547222], Dion and Bocelli both hold a note. Then Dion effortlessly sings two notes higher, taking the final moments of the song into the stratosphere. What is so apparent in that moment of their performance, and what I heard time and again through the Grand Veenas, is a rightness in Dions effortlessness, and a sense of inevitability and mastery in their performance. To a certain extent, though, speaking about the treble in isolation is an artificial distinction. The integration of the Veenas drivers from the midbass on up was excellent. As hard as I listened for it, I couldnt hear a transition from one driver to the next in the frequencies above about 100Hz. In part, this must be credited to the directly connected midrange driver, which performed its duties with as little distortion and as much detail as Ive heard. But the minimal electronics associated with the high-pass filter for the tweeter paid off here, too. The attention Reference 3A has paid to maintaining correct phase across the audioband also undoubtedly played a key role. Even more than these technical distinctions, though, music itself was extremely well integrated. Performances held together effortlessly (again, that word), and it was easy to lose myself in the music. My reference CDs got more than their usual few minutes of play, and I listened to more than one of them right through to the end. For instance, Hugh Masekelas trumpet on his Revival [CD, Chissa HUCD 3093] was better than Id ever heard it. There was weight to the fundamental tones and an expressiveness to the upper harmonics that were both convincing and compelling, in the toe-tapping sense. Its hard to sit still when you feel -- nay, know -- that the entire performance is right there. More air guitar was played in my listening room than at any other time I can remember. My inner conductor got a workout, too. The range of music successfully conveyed by the Grand Veenas was impressive. I spend more time with classical music than anything else, but everything -- from the wide variety of percussion on James Ashers Feet in the Soil [CD, New Earth 9512-2] to the slamming bass and intricate instrumentals on Loreena McKennitts An Ancient Muse [CD, Verve B0007920002] to Jennifer Warness beautifully expressive voice on the reissue of Famous Blue Raincoat [CD, Shout Factory 826663-10490] to the gritty authenticity of Mapleshades sampler 13 Shades of Blue [CD, Mapleshade 10032] -- had a vividness and a sense of reality that kept me believing. The word this old English majors memory dredged up was verisimilitude: the sense that what youre reading -- or, in this case, hearing -- is true. Thats the audio road the Grand Veenas took me down, and I was a willing traveler. I will say that the Grand Veenas soundstaging was not as precise and solid as that of the soundstaging champions Ive heard in my room, the KEF Reference 203/2 speakers. The KEF benefits from having its tweeter positioned in the middle of its midrange driver; in the Grand Veena, the centers of the drivers that produce the frequencies that potentially most affect sonic imaging are several inches apart. That said, the additional high-frequency information provided by the Grand Veenas lent an extraordinary sense of air and space to the music, and their overall performance had a convincing quality that was very satisfying. The other area in which the Grand Veena fell slightly short was that of bass extension and integration. Its twin 8" bass drivers per speaker are responsible for the bulk of the sonic energy below 90Hz or so, and they did a very clean job of reproducing those frequencies. However, after a mere octave and a third (down to 36Hz) they are 3dB down, and rolling off at a rate of 12dB/octave; a ported speaker cabinet can work only so much magic. Furthermore, there was a slight dip in the intensity of the bass at the point where the midrange driver passes off its duties to the bass drivers. Neither of these issues may be noticed much if the speakers are matched with a room that can cleanly reinforce the low-bass frequencies, as they were when I first heard them at the Rocky Mountain Audio Fest. These issues also may not matter much with classical music -- even orchestras in full voice. But for bass heads or rockers or lovers of pipe-organ music, and especially if the room is not an ideal match, some sort of bass reinforcement may be in order. A Zen moment: What is the sound of an inaudible supertweeter? Reference 3A claims that the Grand Veenas +20kHz "ultra high frequency exciter" adds ultrasonic -- i.e., inaudible -- information to the speakers output that enhances the perceived detail of the sounds you can hear. A more preliminary and not unreasonable question might be, can you hear it do anything at all? Some interesting research is reported by James Boyk of the Caltech Music Lab in his article "Theres Life Above 20 Kilohertz! A Survey of Musical Instrument Spectra to 102.4kHz." The main point Boyk makes is that at least one member of every family of acoustical musical instruments (strings, brass, woodwinds, percussion) produces energy at 40kHz or above. For example, the amount of energy above 20kHz produced by a pair of clashing cymbals is over 40%. Though most instruments have a far lower percentage of their energy in this range, a trumpets output of energy above 20kHz can be as high as 2%. Does this matter in what you hear? Taking my lead from Boyks data, which suggest that the easiest instruments to hear above 20kHz might be cymbals and trumpets, I found two selections of music with those two instruments and listened to them carefully. The first was an old favorite, "District Six," from Hugh Masekelas CD Revival. I repeatedly played a section of Masekelas trumpet solo while standing next to one Grand Veena, then carefully covered its supertweeter with the cupped palm of my hand and played the section again. The difference was hard to hear, but covering the supertweeter resulted in a subtle blunting of the top end of the sound. Much easier to hear was the difference in the opening bars of Louis Lane and the Atlanta Symphonys recording of Aaron Coplands Fanfare for the Common Man [SACD, Telarc SACD-60648], a 50kHz master transfer. I was surprised that I couldnt hear more than a vanishingly subtle difference in the huge opening crash of the gong in that piece, but as the crash subsided, the air around it was obviously more open with the supertweeter uncovered. When the trumpets entered, the sound was again clearly more open and extended. During sustained trumpet notes, rapidly covering and uncovering the supertweeter even led to a subtle "wah-wah" effect. Tash Goka also claims that the Murata supertweeter increases the detail heard in the lower frequencies. Carefully listening to SACDs, I think I heard this effect. But I dont think I was hearing high-frequency trumpet sounds, for instance, making other instruments or voices sound more detailed. I believe it makes most sense to consider this sort of effect as similar to that produced by speakers that have "precise and tuneful bass" (if I may borrow a promotional phrase from the Grand Veena manual). Certainly, precise bass has something to do with the accurate reproduction of the lowest frequencies. But it also has a lot to do with adequately replicating the higher-frequency sounds associated with those deep-bass notes -- the harmonics and pluck of a double-bass string, for instance, or the resonance of a drumhead. I think the supertweeter increases the degree of articulation of an instruments lower frequencies by providing some of the high-frequency details associated with those lower notes. So there really is something going on. I heard the presence of the Grand Veenas supertweeter as a level of realism that added to the persuasiveness of the reproduced sound. It certainly mattered more when the recording actually had the high-frequency information available to play back, as do SACDs and other high-resolution formats. As we move into the hi-rez digital age, the Grand Veena is ready to reveal the possibilities. My system isnt set up to play vinyl, but I imagine these speakers would produce some interesting effects from high-quality LPs as well. To Bybee or not to Bybee? Ive bought and installed a number of Bybee purifiers in speakers Ive owned, and have also used them with interconnects, to generally excellent effect. They seem to clean up the sound, making everything clearer and more precise. Ive also sometimes found that they remove a bit of expressiveness and expansiveness from the music, so Ive become more cautious about using them than I was at first. The Grand Veenas I heard at the Rocky Mountain Audio Fest had Bybee purifiers installed internally, at the speaker terminals. I liked the sound, and would have preferred that my review pair were similarly fitted. Instead, they came with two attractive aluminum boxes, with terminals and cables that contained the Bybees. I broke them in along with the speakers for over 200 hours. But while the boxes indeed added clarity to the sound, they ultimately subtracted more than they added, perhaps because of the two additional sets of connectors between speakers and amplifier. So I did most of my listening without the Bybee boxes, and my conclusions about the Grand Veenas have been made without them. Nonetheless, internal Bybee purifiers are potentially a very positive and significant addition to these speakers. What Reference 3A has accomplished with the Grand Veena is, by any standard, extraordinary. Of the several dozen other speakers in its general price range that Ive listened to carefully, Ive heard none that matches its overall performance, and it is absolutely unequaled in my experience from the midbass on up. Some competitors at the price have better bass extension, but none Ive heard exceeds it in bass detail. And some create a more detailed soundstage but none does a better job of re-creating the total experience of the recorded event. As a reviewer, I appreciate gear that gives me the best window on the music, as well as insight into the other audio gear in the system. And as a guy who loves music, I appreciate an audio system that gives me as much of the music as it can without getting in the way. The Reference 3A Grand Veena does both, and Im pleased to make it an Ultra Audio Select Component. These modest-looking boxes -- and the skills of the guys who design and build them -- will be appreciated in the audiophile world for a long time to come. Price: $7995 USD per pair (with internal Bybee purifiers).